The Haymeadow parcel is 660 acres. 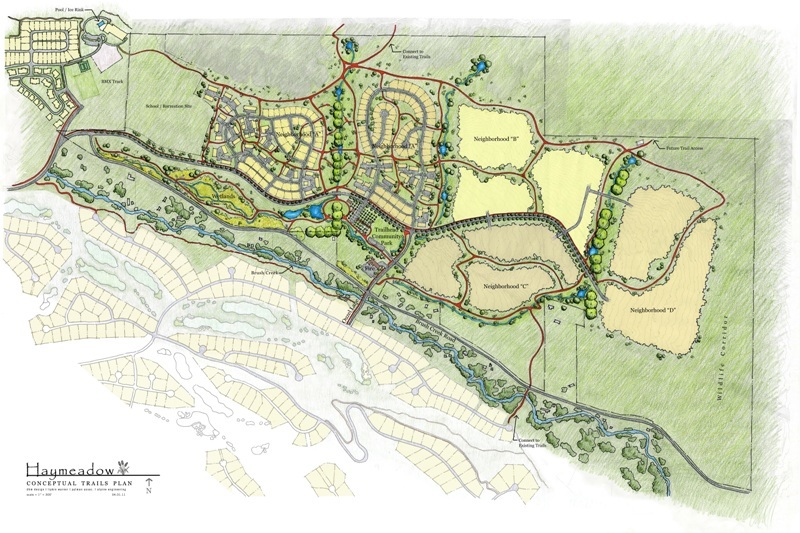 The proposed density of the Haymeadow project is 979 homes or about 1.5 homes per acre. Approximately 60% of the parcel will remain open space. The project will be phased with three specific neighborhoods. Neighborhood A, which includes around 400 units, would be the first phase of development because it is located closest to town. It is also the most dense part of the proposal. It is expected it will take at least 20 years to build out the project. The property is adjacent to the Eagle Pool and Ice Rink site southeast of town. Annexation petitions have also been submitted and in the weeks and months ahead, the project will be examined by the Eagle Planning and Zoning Commission, and ultimately the Eagle Town Board. Will the local real estate market support a project of this size, even if it doesn’t start for several years? The Eagle market is being driven downward by bank owned properties and short sales. Most builders believe it is cheaper to buy than build. How long will it take for that to change? Will the Eagle infrastructure support this project, including water and sewer services? How will Eagle resolve the significant traffic issues that already exist on Eby Creek Road and how will this project contribute to those solutions? How will this project impact wildlife movements across the parcel? I will be personally impacted by this project. I live on Brush Creek Road and would like to see traffic diverted from Brush Creek Road to the main road through this subdivision. As a real estate broker, in general I support new residential projects throughout the Valley. 86% of the County is federally owned land so what land we have to build on should be utilized in the most efficient manner that fits with the community needs. I’ll need to look more closely at the details of this proposal as it moves forward through the review process. My guess is that this project will ultimately be placed in front of the Eagle voters as Eagle River Station was. Even as controversial as ERS was, this project stands to polarized voters even more as this parcel is not located between a freeway and a highway and is much more picturesque. It will be an interesting process. Stay tuned. This entry was posted on May 4, 2011, 8:42 am and is filed under Vail Valley Real Estate. You can follow any responses to this entry through RSS 2.0. You can leave a response, or trackback from your own site. We can (agree?) there is no market for these new homes in Eagle today. PS rumors circulating…Avon Town Council members being deposed this week – all came down with a sever case of amneisa…after being sworn in. You are probably right about the developer’s intention. I’d love to see some new jobs in the County. As you know, our construction industry has been devastated.